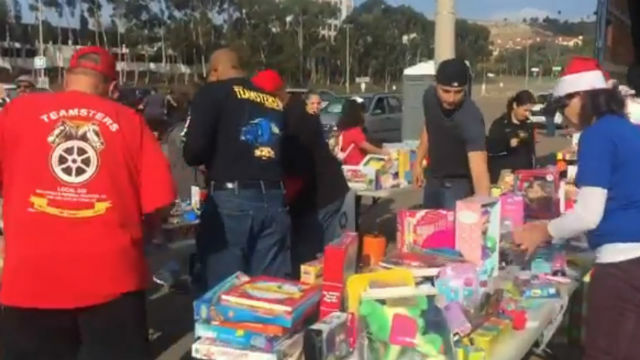 More than 650 families from San Diego and Imperial counties Tuesday received donated toys, gifts and holiday dinner fixings from the United Way of San Diego County and the San Diego and Imperial Counties Labor Council. The 31st annual Holiday Food and Toy Distribution was organized by the Unions United partnership between United Way and the labor council. More than 500 San Diego County families and 150 Imperial County families participated in the event. Union workers in both counties contributed to the distribution effort, according to Unions United, and the donations will help United Way’s food pantry stay open year-round. Recipients included low-wage healthcare and hotel workers who went on strike this year calling for higher wages and better working conditions, along with recently immigrated families and fire victims.